Why? 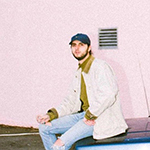 The 4th edition of the Let’s Hear it Live showcase features Rare Americans, N0V3L, and Land Line! Why? Dan (of Bend Sinister) has a new solo album coming out (hopefully) late 2019, and is going to be performing songs from it live at Blue Light Studios. Why? 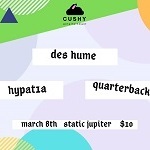 Catch some dreamy vibez with des hume tonight at Static Jupiter! Why? Two Vancouver bands for the price of one tonight, and OMC has a new record out now too!